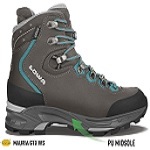 Make way for the new JURI GTX® HI and JONAS GTX® MID winter boots to arm the kids for every adventure. No wonder, that the grippy LOWA Kids Winter Trac® outsole’s tread pattern offers the best grip on any sledding hill. And to make sure not a second is lost on the way to school, slipping them on and off is true child’s play thanks to side zippers or practical hook-and-loop. Functional and filled with performance, both winter models with their brightly coloured design for big and small will be well received. But not only the kid-friendly look ensures total joy on dreary grey days in combination with durable fabric material. The cosy soft GORE-TEX® Partelana lining also warms the cockles of small hearts in storms and keep sensitive food reliably warm on wet and cold days. 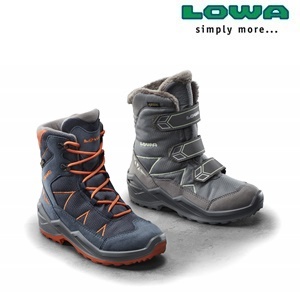 For more stability and best warmth, the sole is a little wider and thus promises optimum comfort. The JURI GTX® HI and JONAS GTX® MID models win the balancing act between functional winter boots and cool design with bravura -both at play or on the way to school. These trendy winter boots are on every adventure.